It is 100% NATURAL (from plant source), and does not contain additives, preservatives, chemicals, artificial coloring and flavoring! 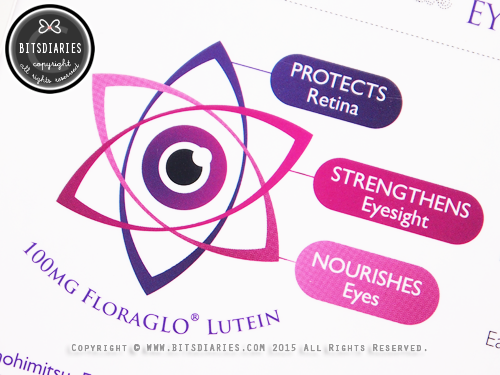 - FloraGLO® Lutein combats free radicals and filters damaging blue light to protect retina and optic nerves. - Maqui Berry Extract has a rich content of anthocyanin, particularly delphinidin that is excellent in preventing degenerative conditions of eyes by inhibiting light-induced damage on retina. 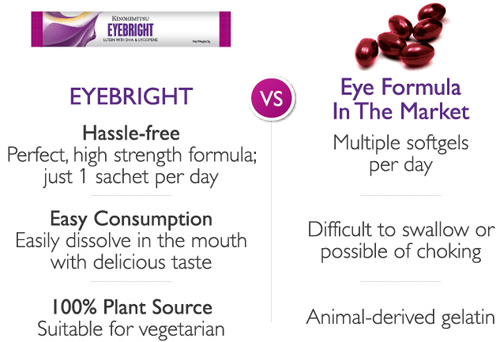 - Purple Rice Extract contains anthocyanin content, which helps to reduce eyes fatigue and improve visual acuity. - Lycopene (Tomato Extract) is the best inner moisturizer to relieve eye dryness and restore charming blink in eyes. - Beta-carotene (Dunaliella) improves the eye conditions such as poor night vision, dry eyes, eye inflammation and reduces the risk of age-related macular degeneration (AMD). - DHA (Algae) ensures retina functions properly and able to reverse the symptoms of dry eye syndrome. Each box comes with 30 sachets (= 30 days supply). Fun Fact: Kinohimitsu EyeBright contains the highest amount of lutein (100mg) in the market, and just 1 sachet is equivalent to 17 cups of spinach! It is high in anti-oxidant!!! It is halal certified and also suitable for vegetarian! Directions Of Use: Take 1 sachet daily before *breakfast. You can just consume it directly in powder form. Alternatively, you can dilute it with 50ml water. *P.S. : It is recommended to be consumed before breakfast as the absorption rate is at its peak in the morning. 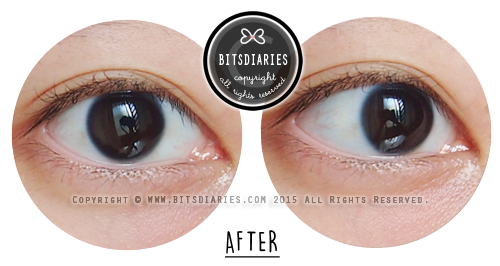 In the past few months, I had complained about my dry/fatigue eyes problem in a few of my blog posts. Well, my dry/fatigue eyes have always been an annoying problem for me. Argh! Besides, I am nearsighted and a contact lens user, and am of course exposed to electronic devices for long hours. 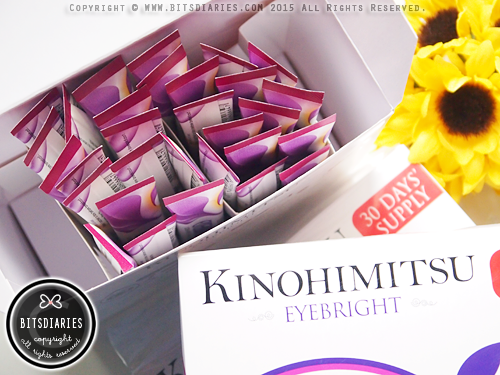 Before I started taking Kinohimitsu EyeBright, I will always wake up with dry eyes (bloodshot eyes) in the morning. This creates discomfort when I wear contact lenses and because of that, I have to rewet my eyes with lubricant eye drop frequently throughout the day. 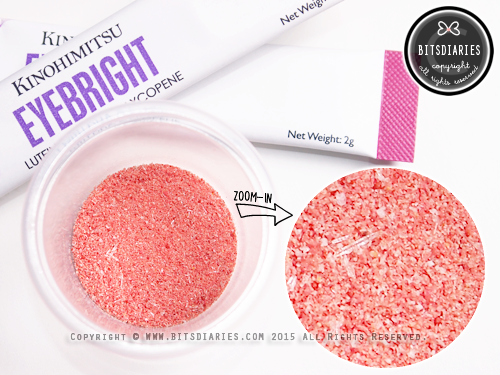 I started taking EyeBright on 1st September 2015. After taking it for a week, I noticed my dry eyes were less irritated in the morning. I also felt the discomfort level has significantly been reduced when I wore contact lenses. 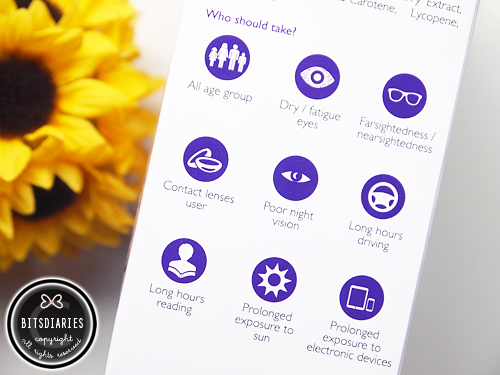 After just two weeks of taking EyeBright, I bid farewell to my dry eyes — problem solved! 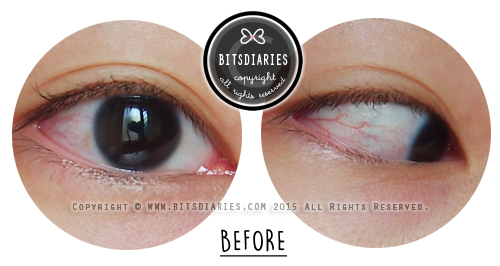 I don't need to use eye drop anymore, cause I wake up with healthy eyes every day~! Today, my vision has become more focused and sharper. 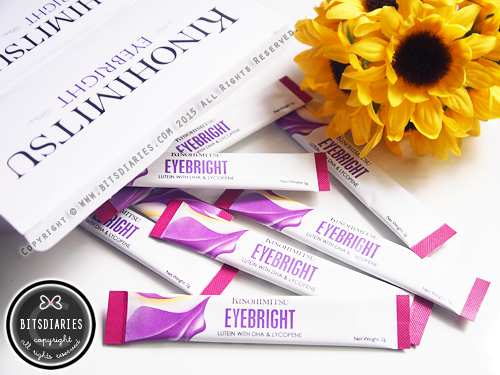 I can clearly feel the EyeBright nourishes and keeps my eyes well-moisturized, preventing dry and irritated eyes, as well as strengthens and improves the health of my eyes for a better vision. Overall, in my most honest opinion, it lives up to what it claims — IT WORKS! I have stocked up 5 boxes at home as it has officially become an essential supplement I have to take every morning! I simply can't stop raving about how effective this supplement is! If you are constantly staring at electronic devices, wearing contact lenses for long hours and/or having dry/fatigue eyes, you gotta give this a try! Actually I highly recommend it to everyone, even if you don't have any eye problems. Well, you only have a pair of eyes, so it's better to start taking care of them before it's too late. 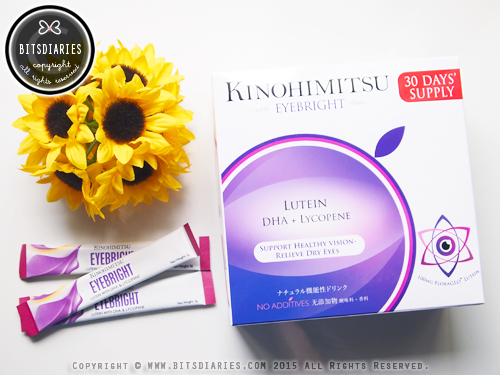 Kinohimitsu EyeBright is available at http://sg.kinohimitsu.com/, the pharmacies (Watsons, Guardians, Unity) and Kinohimitsu Beauty Counter at OG Orchard Point, People's Park and Albert Complex at the price of SGD$59.90. And also, check out my review on the Kinohimitsu Clear Activ. Does it improve myopia conditions? Don't get cheated by this brand, their ingredients either overstated or deliberately omitted in their box.